I did not read this cover-to-cover, so take everything with a handful of salt. I liked what I read, but this book feels uneven and rushed in parts. Perhaps that is because his subject is so big. While it feels incomplete, the book does raise some pertinent questions, given the recent rise of China and India. Couldn’t science and medicine go together? As usual, he has many great visual aids, graphs, etc. 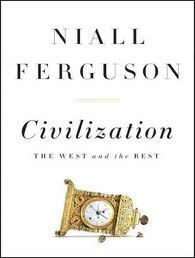 Ferguson has an interesting take on the decline of religion in Europe vs. America, and he roots the difference at least in part on America’s more total embrace of competition and the market and its application to churches. He makes the astute observation that having done so, America’s consumer oriented churches will feed an enfeeblement of values that unhindered consumerism brings with it. Thus, while American churches will tell its parishioners to do what we say, not what we do — it probably won’t work. This was a rare moment of interesting argument for Ferguson (in this book at least), but it doesn’t hold up for me. True, Europe has its state churches, but people are not forbidden from going to Catholic churches in England or Baptist churches in France. The real difference must lie elsewhere — in a deeper place. The whole religion question seemed like a great opportunity for Ferguson. Here he truly dabbles in some controversy, such as mostly agreeing with Weber’s much discredited ideas surrounding Protestantism. He discusses the rise of Christianity in China and calls it a significant factor in China’s recent rise. By his not not so subtle implication, the decline of Christianity in Europe might be cause for its decline. But having broached the topic, he swerves away. The whole religion question seemed like a great opportunity for him. But he just dips his toe. Jump in, Mr. Ferguson! Sometimes I disagree with you but I like that you make people think and reconsider their ideas. He does not do that here as in some of his other books. Another moment of missed argument – the idea of a civilization’s ‘confidence.’ He dismisses some of Kenneth Clark’s views on civilization but then basically agrees with one of Clark’s key points, that civilizations need ‘confidence’ to survive. He then comes close to calling out various Western academics that teach nothing but the evils of Western civilization. He almost asserts that such people undermine the basic psychological foundations of the west, an argument many conservatives make. But again, he does not press it home or follow its implications. This is what makes this work so tame in comparison to others. He no longer acts like the young historian out to take on the world, like in ‘The Pity of War.’ I disagreed with decent chunks of that book, but it was fun to read. This one is boring, if not still informative. He raises, but leaves wide open, the question of whether or not China’s rise will mean a smooth transition for the West or not. China has gotten more powerful by adopting many of the ‘Killer Applications’ that made the West. Is this good for us? Should we root for China to become more western? Will the U.S. in 20 years be China’s partner like England is to the U.S.? Or will it go worse for us? Ferguson hints, dances, and leaves it in the air. Here’s hoping that Ferguson takes some time off from books and tv, goes into a cave, and emerges five years from now with something better.